When Avrim Topel became disabled, he and wife Vicki needed to simplify their lives. They needed to downsize into a home that would provide them with one-floor living, eliminate most of the maintenance and upkeep chores, and create a healthy environment that would greatly reduce most of the utility (electric and gas) expenses. Upon presenting their criteria for a new home to green builder, she immediately identified their needs with the features and benefits of green homes. For the next twenty months, the couple was consumed learning about, planning, and building a green home planned and built to the exacting criteria of the U.S. Green Building Council's, LEED (Leadership in Energy and Environmental Design) Green Building Rating System. The USGBC is the nation's authority on green design and construction, and its' LEED program is the national benchmark for green construction. The home was awarded LEED Silver and Energy Star Qualified Home certifications upon completion, and went on to become a USGBC Project Profile, one of only eight homes in the nation to be showcased on the USGBC's web site and educational literature as examples of the LEED For Homes program homes. Green homebuilding differs from traditional construction as it includes a professional team approach to planning and construction, and the Topel's professional creative team included the green builder, an eco-architect, a sustainable engineer, and a landscape architect who were among the most respected members of the Philadelphia region's professional community. Two of the members teach and are associated with Philadelphia's leading graduate university sustainable design and development programs, and all promote the cause with various outreach efforts. When Avrim and Vicki decided to build green, they became frustrated with the lack of books that provided a clear overview of green homes. Their professional team committed to teach them as much as they could about green building and sustainable design as they became active participating members of the team every step of the way throughout the project. Coming to understand the wonderful benefits green homes provide for their occupants, the communities in which they are built, and how they conserve and protect natural resources and serve as a positive force for the greater good, the couple was inspired to help others learn about green homes with their outreach program that includes their book, video, and educational tour programs. Green homes are about choices and relationships. There are many green, healthy, energy efficient products available to choose from today when building new, remodeling, adding on an addition, or replacing and upgrading existing systems. These products and systems have relationships with each other and the rest of a house. Some work splendidly with each other, and some don't. By understanding the big picture, one can proceed to make informed decisions and choices when it comes to selecting green, healthy, energy efficient products and systems for one's home. It's not rocket science. 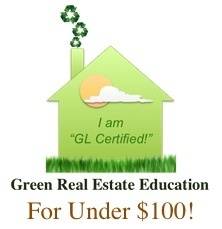 Anyone can gain a good understanding of green homes presented the right information. The problem is, most books on the subject are reference books written using technical language that segregate various parts of a home by subject (i.e. heating, solar panels, plumbing, etc.) and do not explain green homes as the total of their parts and systems working together as a result of informed, intelligent choices. It is our intent to provide our readers with a clear understanding and overview of green homes. Knowledge is power, and with the shared knowledge in our book, homeowners and professionals alike will become empowered to understand green homes and to proceed with their green and sustainable homebuilding projects with confidence and clarity. GREEN BEGINNINGS: The Story of How We Built Our Green & Sustainable Home uses our true story learning about, planning, and building our green home to explain and help others understand green homes. The home, affectionately referred to as the Green Beginnings House, was awarded the LEED Silver designation from the U.S. Green Building Council, the nations authority on green design and construction. The USGBC's LEED Green Building Rating System is the national benchmark for green design and construction. The Green Beginnings House has also been selected by the USGBC as a LEED Project Profile, one of only eight homes nationwide that serve as examples of the LEED For Homes program on its website and educational materials. Written in plain, non-technical simple English, our homespun narrative style of storytelling, interjected with valuable lesson boxes, provides for an enjoyable read and meaningful learning experience. We begin our story by explaining what the terms green and sustainable mean as they relate to homes. We provide a historical overview of where the notion of green homes came from, and explain the criteria for green homes as defined by the U.S. Green Building CouncilÕs LEED For Homes program. We cover builder and architectural contracts, site work, permitting, and with green and sustainable recycled and reclaimed materials, products, systems in the order which they were experienced. The actual construction process is presented in a captioned photo essay that includes over 100 sequentially presented color photographs that take the guesswork out of what various products and systems look like. A glossary of terms and language are helpful resources that aid comprehension, and our closing "Reflections in Hindsight" point out key items to remain cognizant of when building green. Finally, our book is unique as it provides for the first time insight written from the homeowners perspective by a couple who experienced learning, planning, and building a green home that ultimately became a published example of the nations benchmark for green homes by the U.S. Green Building Council. 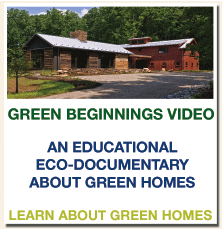 The Green Beginnings Video is a unique, original-content eco-documentary that features the professional team who built the Green Beginnings House, an award-winning LEED Silver green and sustainable home. The team offers perspective as they explain the project and green homes in a new stand-alone educational film that can also be utilized as an adjunct teaching companion to the Green Beginnings Book that explains the project and green homes from the homeowner’s perspective. Viewed together with the Green Beginnings book as a complete green homes educational package, viewers are offered a unique opportunity to learn about green homes from both the homeowners' point of view (consumer mindset) and the professionals' perspective. Produced by Freeland Media in association with Amy Cornelius, LEED AP, Hugh Lofting Timber Frames, and directed by award winning cinematographer Erik Freeland, the film depicts the collaborative effort between the professional team and homeowners who designed and built the Green Beginnings house, a U.S. Green Building Council LEED Silver home. Shot on location amidst a picturesque backdrop of rolling farmlands in Kennett Square, Pennsylvania, the film follows the true story of planning and building a state-of-the-art green and sustainable home. A top-notch professional creative team assembled by green builder and legendary timber frame artisan Hugh Lofting (whose grandfather of the same name authored the Dr. Doolittle books), an extraordinary homebuilding project, and a collective commitment to the cause make a powerful emotional connection with the audience and sets the stage for this eco-documentary to become the new, definitive, “learn about green homes” educational video of the times. The story begins with project manager Amy Cornelius and eco-architect Matthew Moger, Lyman Perry Architects (prior HGTV productions) recounting the events that lead to the homeowners' decision to build green. Cornelius explains and defines green building as Moger recalls the homeowners’ learning process and expounds upon good, smart, sustainable design and the relationships green homes have with the surroundings from which they are created. Moger’s eloquent descriptive language evokes powerful imagery, and the homeowners’ commitments to learning about living green and becoming active participants in the process are genuine and provide a glimpse at today's consumers embracing change. Freeland's months spent on location researching the holistic green building process enable him to reveal the interdependencies among the respective professionals that are requisite with today's green building. In a series of engaging interviews between host Lou Oliviere and members of the professional team, filmmaker Erik Freeland surpasses prior construction film benchmarks as he captures the collective essence and spirit of the integrative green building approach as recommended by the U.S. Green Building Council for the first time on film. Oliviere's intelligent queries prompt the builder, architect, sustainable engineer, and landscape architect to discuss their respective areas of expertise as they tour the home and property in a way that ultimately reveals how the pieces come together to make the home green. Sustainable engineer Tad Radzinsky, P.E, whose role was to specify all products and systems green and sustainable, reduces otherwise hard-to-understand technical terms and concepts into simple applications and language in the spirit of helping others to understand green homes. This educational film differentiates itself from other how-to green building videos by presenting the subject matter comprehensively and holistically in the spirit of the integrative green building approach recommended by the U.S. Green Building Council's LEED Green Building Rating System. When viewed together with the Green Beginnings book as a complete green homes educational package, the audience is presented a unique opportunity to contrast the homeowners' perspective and consumer mindset with the professionals' understanding of green homes and homebuilding to hear both sides of the story. This movie uses a real-life experience to present a comprehensive overview of green homes including how the various professional disciplines and their respective technologies, materials and systems work together to produce green homes, the amazing 21st century dwellings that provide significant health and economic benefits to their occupants and the communities in which they are built, and serve to conserve natural resources and remedy the environmental ills that are ravaging the planet. The GREEN BEGINNINGS BOOK explains the experience of learning about, planning, and building an award winning green home from the homeowners' perspective. The GREEN BEGINNINGS VIDEO presents the same experience from the professionals' perspective and continues the dialogue to complete the conversation between the homeowners and their green builder, architect, sustainable engineer, and landscape architect to reveal both sides of a fascinating green home story. Our new, innovative experiential approach to learning about green homes is now offered as a timely and relevant adjunct curriculum and stimulating learning experience and/or forum to engineering, architectural, and environmental studies classrooms. The Homeowners story provides a unique opportunity to understand green homes built to the exacting criteria of the U.S. Green Building Council's LEED For Homes Green Building Rating System, the national benchmark for green design and construction. It also provides a unique opportunity to witness today’s consumers embracing new technologies as our collective awareness of energy and environmental issues permeate the global culture. The GREEN BEGINNINGS HOUSE, a LEED Silver and Energy Star Qualified Home in Kennett Square, PA has been named a USGBC Project Profile, one of only eight homes in the U.S.A. selected to showcase the LEED For Homes Green Building Rating System. Created in the spirit of the USGBC's integrative approach to planning and building green homes, the curriculum provides students a unique opportunity to learn about green homes and begin to understand how consumers are adapting to change as they prepare to enter the new world workforce of new green jobs. While the adjunct nature and universal relevance of this special curriculum allows educators to introduce the assignment into class schedules anytime during the semester, the numerous disciplines included in the content posture it ideally as an opening discussion at the beginning of a semester. 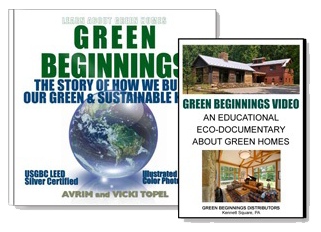 Educators will be provided with a complimentary textbook edition of GREEN BEGINNINGS: The Story of How We Built Our Green & Sustainable Home (ISBN 1-4392-1219-8), and a DVD version of the GREEN BEGINNINGS VIDEO to preview. The book is a two-hour (max) read; the video has a 25-minute running time. Students read the book, view the video, and convene to discuss the content. Books and DVD Videos, including downloadable PDF books and streaming media versions of the video are available with special student pricing at our website and Amazon.com. Wholesale book distributor, Baker & Taylor, works with all university bookstores. Textbook cover edition books and DVD's are complimentary to faculty, along with suggested topics for classroom discussion. Additionally, an author or other primary professional contributor to the GREEN BEGINNINGS HOUSE will be available upon request to conduct a Q & A session in-person or over the Internet. 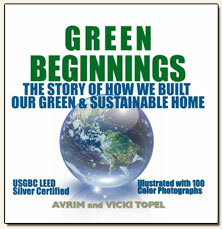 Green Beginnings is the outreach initiative of husband-and-wife author team Avrim and Vicki Topel to introduce and educate people about green homes with their book, educational tours of their home, and their video.